The first step in the development of a tractor is producing quality materials. 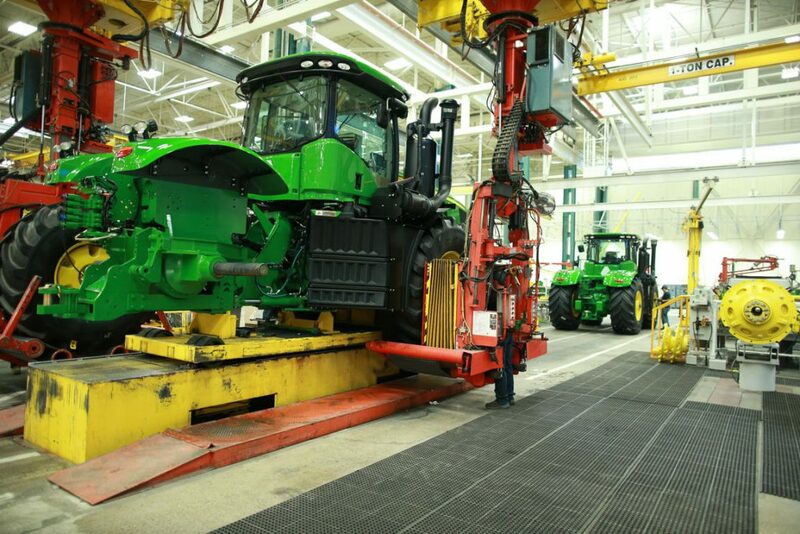 John Deere is the only ag manufacturer in the nation that has its own foundry. It’s important for them to keep the process of tractor development under one roof for quality control purposes. Keeping this aspect of manufacturing in-house also allows easier casting and tighter tolerances to match the increasing size of many tractors. The next stage in development is what they call Drive Train Operations. John Deere Waterloo Works tests all critical components with press force monitoring to make sure everything is assembled in the right sequence. Over the course of this development stage, a piece of equipment will be tested about 500 times for potential problems. Additional tests also look for issues with hydraulic leaks to ensure that there isn’t any machine downtime later on for the customer. Nothing is passed on to the next phase of development without passing these tests. The final stage of development is the Tractor & Cab Assembly. Every part of the assembly process is done by automatically-guided vehicles so that nothing is missed or forgotten. After the assembly is complete, each tractor spends 20-45 minutes in a test bay to check machine vitals. Tractors also spend time in a blacklight bay so inspectors can go over every detail of the tractor to make sure nothing is leaking. Once the tractor passes this test, it goes through a rigorous driving test to make sure it performs like it was built to. The result is well-built machine ready for the customer. John Deere Waterloo Works takes pride in the tractors the build from start to finish. The factory believes that their people make the biggest difference in the product so special initiatives are taken to make sure that John Deere retains talent. Take a look at this insightful video to see every stage of development in action.